The Tea Party taught us how to resist Donald Trump. 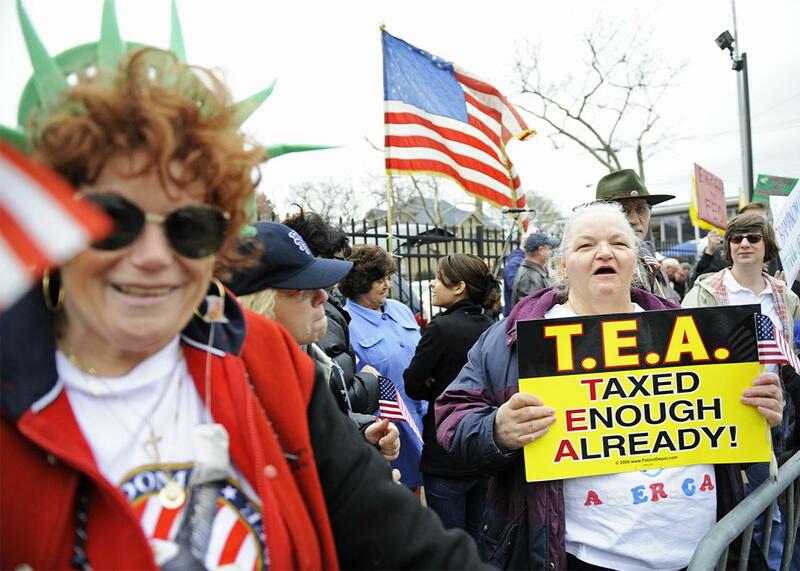 Tea Party members protest in Staten Island, New York, on April 15, 2009. The Tea Party protests of 2009, culminating in the feverish health care town halls of that August, were not a pleasant time for Democratic members of Congress. There were countless stories of Democratic members getting booed and yelled at, fearing for their physical safety, or being burned in effigy. Things got hot. And it all mostly worked. “Anybody who was working for progressive members in 2009, 2010 has a personal story to tell about how the Tea Party impacted them,” said Ezra Levin, who at the time was a staffer for Texas Democratic Rep. Lloyd Doggett. A meet-and-greet Doggett held early that August in a grocery store, for example, quickly turned into a raucous protest. A video recording of it was among the first of many to go viral. Doggett represented a safely Democratic district, so the disruption didn’t deter him from supporting the Affordable Care Act. But it was incidents such as this one that built up the impression of mass discontent with the Obama administration and its large congressional majorities. Levin doesn’t think Democrats should replicate those Tea Party scenes and their nastier elements. But he and a couple dozen other former Hill staffers do think the Tea Party was onto something with the way it applied pressure at a local level, against individual members, to stifle the Democratic administration and eventually put it wholly out of power. “Indivisible” was a hit from the moment it dropped online Wednesday night, earning raves from journalists, artists, former government officials, a candidate for the Democratic National Committee chairmanship, and George Takei. “We have been just absolutely overwhelmed. You don’t know when you put together a 23-page guide on saving democracy that anyone will read it,” Levin said in a Friday interview. “But we posted it the night before last and have been just really touched by the response we’ve had.” By Monday morning, after a long weekend of work done out of Levin’s house with new volunteers who wanted to pitch in, “Indivisible” had a fresh new website, Twitter handle, and flashier design. “And shockingly,” he added, “there hasn’t been some kind of troll blowback.” It’s early yet. Levin is careful not to take credit for this; he notes that he’s just one of many authors. He’s only handling press because he has the flexibility to do so. (Levin works at a D.C. think tank now. His work on “Indivisible” is done in his spare time.) But the idea came up a couple of days after Thanksgiving, when he and his wife, Leah Greenberg—another former Hill staffer—were at a bar in Austin with a college friend, Sara Clough. Clough was the volunteer administrator for an online group that popped up after the election. * Group members wanted to counteract Trump in some way, but they were unsure of how to do so. Levin and Greenberg decided it would be useful to leverage their know-how from their time on the Hill to disseminate best practices for how to get members’ attention. They took a “first whack” at outlining some of their thoughts and spread the document around to their network of old colleagues to fill in. The most effective ways for people to resist aren’t through indignant tweets. It’s by taking on their own members of Congress, on their turf. One of the guide’s more useful charts shows what members of Congress care about versus what they don’t. They care about “local press and editorials, maybe national press”; they don’t care about “wonky D.C.-based news,” though it “depends on the member.” (If I may: Somewhere between zero and no members of the incoming majority care about wonky D.C.-based news.) Members do care about “an interest group’s endorsement.” They don’t care about “your thoughtful analysis of the proposed bill.” They don’t care about “form letters, a Tweet, or Facebook comment.” But they care if you and a group of like-minded individuals show up to their town hall or ribbon-cutting, ask difficult questions or register dissent, and turn their hoped-for sunny 15-second spot on the local news into a longer story about the anger they faced from constituents. These and other protest actions in the guide are designed to achieve three goals the authors lay forth: stalling the Trump agenda, because members are too busy dealing with their own constituent unrest; “sapping Representatives’ will to support or drive reactionary change”; and reaffirming “the illegitimacy of the Trump agenda.” On the last goal, the authors admit that Trump, Senate Majority Leader Mitch McConnell, and Speaker of the House Paul Ryan will have the votes to push through what they want to put through. Activists’ goal, even if they can’t prevent something from going into action, is to make their members own the consequences and lay the groundwork for their repeal. This playbook might sound familiar. Levin says the authors really, really don’t want the lesson to be that Democrats should copy the worst elements of the Tea Party resistance. “The Tea Party, they really had a whole bunch of really nasty, petty scare tactics, like hanging members of Congress in effigy, or bringing a tombstone with the name of a congressman, or physically assaulting staffers, or yelling really vitriolic things,” Levin said. “That was the ugliness that was the Tea Party, and that was exactly what we’re recommending people not do. The argument in the guide is that’s not what made the Tea Party effective.” It was the harnessing of conservative energy into efficient, local organizing that did that. If Trump and the Republicans’ agenda is going to meet meaningful resistance, it’s not going to be because liberals on Twitter persuaded the New York Times to use “falsely” in a headline, or because some annoying Slate columnist wrote about how the GOP’s Affordable Care Act replacement doesn’t add up. It’s going to be because people made themselves, and their rejection of the agenda, impossible for members of Congress to ignore. “Indivisible” is a more useful document for progressives than all of the online hand-wringing since election night combined.